This was the monument of Abu Abdullo Rudaki in Samarqand. Where is it now? Under grand architectural rearrangement in the Uzbek city of Samarqand two monuments of classical writers of oriental literature were removed. One of the ancient cities in the world has been witnessing grand reconstruction process for several months. Hundreds of small shops and general service spots were demolished. And this is not considering the fact that in spring of 2009 all the additional buildings, adjacent to the first floors of multistoried houses were removed. Few days ago, at the end of July, the monument sculpture, dedicated to Alisher Navoi and Abdurakhman Djami and built on red granite, was dismantled. The monument was located in front of Afrosiab hotel and showed two full statues of poets. Today, the observer also will not find the monument of Abu Abdullo Rudaki, the classical writer of Tajik literature, near the State museum of history and culture of peoples of Central Asia. The future of these monuments is unknown yet. No official comments followed. Responding to our questions, the intellectuals can say nothing: we have no idea what is happening. According to the rumors, the monuments will be placed in new areas. In the background of these events the residents of Samarqand remember unbelievable fates of other monuments in the city. Listening to these "stories", one can make a conclusion that, perhaps, Samarqand is one of those unique cities in the world with most frequently "traveling" monuments. 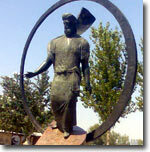 Let us consider the example of bronze monument, erected in the memory of the founder of Uzbek literature Alisher Navoi. Prior to reconstruction, the monument was located near the theater of drama and music, named after Khamid Alimdjan. Later on, the sculptural image of the poet was removed to the other side of the college boulevard when the magnificent monument to Amir Temur, sitting on the throne, was set up. Presumably, the architects considered impossible to locate the monuments of two great people at the same place. The "relocation" did not produce the incidents. The monument of Alisher Navoi is fronted to the same side as the sculpture of Amir Temur. Nonetheless, the experts claimed that was a wrong move. Few days later the monument of the poet was turned over by 180 degrees. It seemed that now the monument is all set. 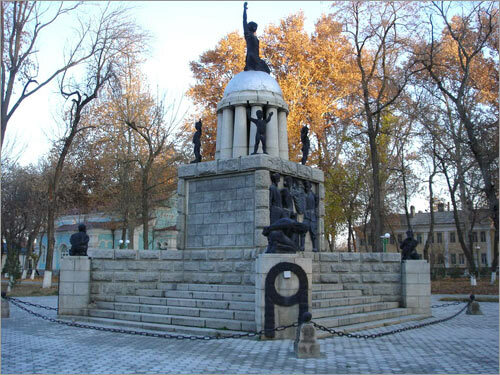 However, after five years ago the general reconstruction of the central park moved the monument of Navoi to the territory of city recreation zone. In the last years the sculpture of another classical writer, Anton Chekhov, also had to change the locations. Once it was set up in the public garden near Russian Drama Theater, bearing his name. Few years ago, the monument was replaced to the area in front of the theater because his old place was occupied by the restaurant. The new place did not become final for the sculpture. The architects considered that the sculpture of Chekhov, located right in front of the theater building, does not fit the landscape of the area; the monument was moved to the one of the side walls. Since that time Anton Pavlovich has been screening the public life through his pince-nez. There were also other monuments in Samarqand whose fortune is still unclear. Thus, at the beginning of 1990s the monument of revolutionary Mirsharapov, a dashing horseman, utterly disappeared. There were also rumors that the sculpture was sold as a piece of nonferrous metal. The Samarqand monument of another revolutionary, Akmal Ikramov, also disappeared long ago. Today, the place of its last location is occupied by the construction of supermarket. It is curious to note that some time later the banana (!) tree was planted in the center of big flowerbed, where the bust of Gorky used to exist. There was even the project that was planning to grow exotic trees in central part of Samarqand. However, the idea did not live long after the incident, when local people barbarously broke this three. There were also funny stories with Samarqand monuments. Back in the Soviet times the sculpture of a girl, playing dutar, was erected by the theater, named after Khamza. In 1990s many poor people were surviving by selling nonferrous metals and in one of the mornings the theater guard discovered that the dutar of the girl was dismantled and thrown 50 meters away. He reported the fact of vandalism. The investigation committee concluded that the criminals intended to steal the nonferrous metal. Running away few meters with stolen instrument, they found out it was alabaster, but not bronze. In the night of July 4-5, 2009 another monument of Soviet era was eliminated in Samarqand. This time the target was one of the best examples of monumental plastics, Liberty monument, built in 1919 by imprisoned Austrian architect from Vienna, Eduard Rush. Besides local workers, the prisoners from Austria, Hungary and Germany contributed to the construction of the monument. Therefore, the fate of many monuments in Samarqand is pretty unusual. However, it is still not clear why the sculptures of many classical writers of oriental literature have been removed. Nonetheless, I believe all these monuments of national culture and the elements of landscape must not frequently "travel", seeking for better fortune.